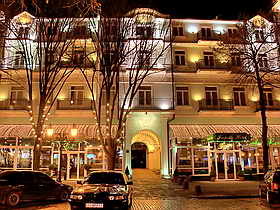 Could ever the famous architect Franz Frapolli imagine that his masterpiece would become such an extremely attractive and place for tourists like the hotel Frapolli which was founded in the historical centre of Odessa Deribasovskaya street. As soon as you enter the hotel with it splendid architecture and the place of residence you will see a well lighted hall that combines classical traditions and a modern style. To sit near the fireside, to look on the fire - it is all what you need to feel yourself happy. 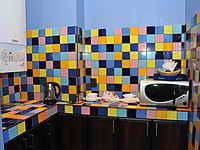 Hotel provided with 24-our guard, out-door video, lift, autonomic water-supply and electricity-supply. Restaurant, hall and terrace of hotel �Frapolli� are equipped with �Wi-Fi� network, for wireless access to the Internet. 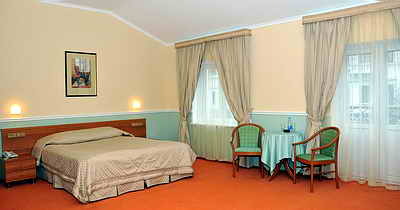 A new double room Suite in italian style with a separate entrance in the yard of the hotel on the first floor. It consists of a bedroom, study and mini-kitchen. 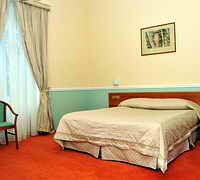 There is a King Size bed in the bedroom, modern furniture, plasma TVset and mini bar. 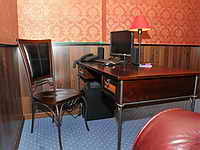 In the study you can find a safe, computer with an Internet connection and a leather sofa. Room service 24 hours. 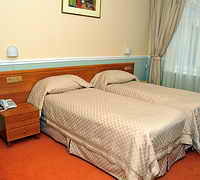 Rooms with double or twin beds. ALL PAYMENTS IN HOTEL SHOULD BE DONE IN UKRAINIAN HRIVNAS. PRICES IN US DOLLARS ARE INDICATED AND CALCULATED ACCORDING TO 1 USD = 8.35 UAH. *The prices valid from 21.08.2018 till 31.08.2018. *The prices are indicated for the room. 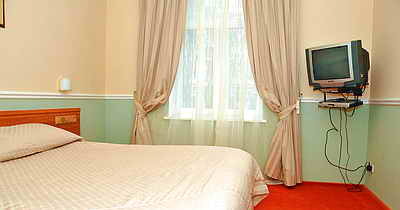 *Children up to 6 years old stay in parents room free of charge. *Extra bed 300 uah (USD 36). *Reservation service is free of charge. *Payment for booking is not raised.